The boy awoke with a start, and the curved glass of the cylinder distorted the face of the girl pounding upon it. His confused eyes met hers peering through translucent green fluid. Feeling the shock of her fist hitting the container, he watched her scream. But the girl’s words were rendered incomprehensible by the liquid and glass separating them. 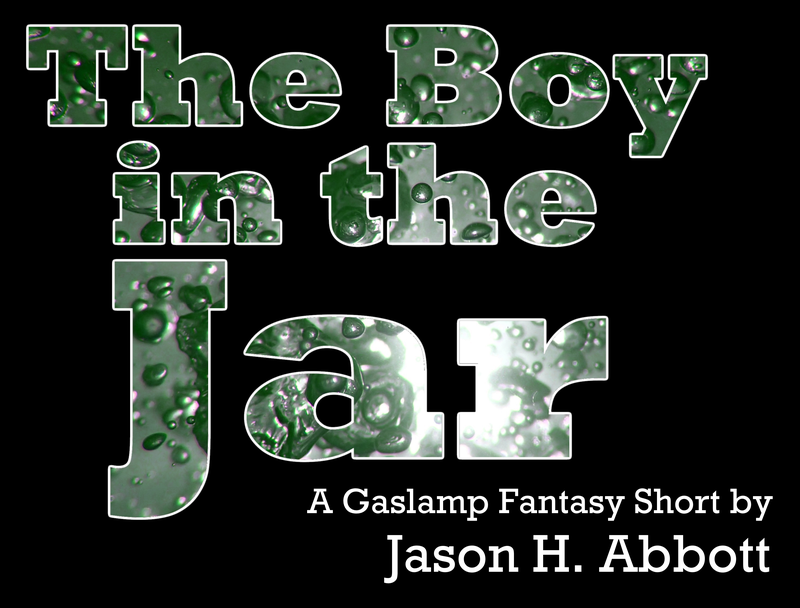 He reached out and touched the side of the man-sized jar he floated in. Then the naked boy’s bewildered look shifted to terror as he began to choke, gag and thrash in the chamber. The girl hadn’t stopped knocking against the glass in her own panic. Catching his attention once more, her vigorous pointing directed him to the twin release valves at the interior bottom of the cylinder. His head bobbed in acknowledgement before he pushed against the container’s sides and inverted his position. Kicking off the chamber’s top, his dive of only a few feet brought him to the hand rings and metal hatch at the bottom. Turning each from vertical to horizontal, he yanked them simultaneously to open the drain. His eyes looked up to the girl pressing her face against the glass. She drew her fists together and pantomimed an exaggerated upward pull. The boy looked back to the rings he held. Bracing into a squat at the bottom of the cylinder, he strained with all the fading strength he had. The valves inched higher, then broke off the hatch. No longer anchored, the snap launched the boy upwards by turning his exertion against him. Visibly gagging, his head bonked against the container’s brass top that branched to the ceiling above with a dozen small pipes. The hand rings slipped from his languid grip, sinking to clank on the bottom drain that remained steadfastly closed. Pale and wide-eyed now, the girl turned from the chamber and the trapped occupant drowning within. Scanning the room, she glanced first to a pair of tables lined with Erlenmeyer flasks and chemicals. Spotting nothing of use there, she looked to the second glass cylinder in the room with its own bottom hatch open and dripping. Then she spied the fireman’s axe hung on the laboratory’s wall. Her bare feet splashed across a floor of small white tiles under a puddle of green fluid. Sliding to a halt, she bumped into the wall before straining to reach the wooden handle and then lift it off its mounting. The axe head fell upon porcelain tile with a crack before wet hands pulled the tool level with her unclothed waist. She rushed for the boy in the jar, her gait more a series of barely controlled slips than a run. Yet with a grunting twist, she slammed the axe into the metal latch at the bottom of the chamber. The impact sent the girl sprawling onto her backside before the axe fell with a clatter to the floor. There was a groan, then a spray of liquid heralded the copper hatch finally springing open. A wave of several hundred gallons gushed forward, shoving her backwards. Jostled and sucked down in the gurgling surge, the boy hit the tiled floor as if rudely birthed. Sliding on hands and knees across slimy tile, she reached where he lay supine. She rolled him onto his stomach, then tugged him up from behind with an arm braced over his collarbone. Her free hand slapped Hubert’s back. With a groggy cough, he spat out a mouthful of amniotic chemicals. It landed with a splat between his shaking arms pushing him up off the floor. He gasped a small, wet breath before retching more liquid out of his lungs. The girl felt his chest heave with choking coughs. Tears mixed in streaks on her stained cheeks. Sliding her second arm around to join the first, she embraced him from behind. The pair remained this way for minutes, his breathing strengthening with every expulsion of fluid. “I thought I’d lost you,” she said into his ear. Hubert lifted his right hand, then gazed at it for a long second before he placed it over hers. “You’ve always said I was bricky,” she sniffed. Meredith helped him sit beside her, then slipped kneeling on the viscous coating of the laboratory floor. She almost sprawled backwards, but Hubert mitigated the fall by grabbing her wrist. Instead, she merely plopped down with a squeal and clumsy splash. His shout echoed in the room, before he clutched his throat hearing its prepubescent pitch. Hubert’s expression was stunned as Meredith brushed back a wet plait of her strawberry blond hair. “T-there… there’s nothing amiss with my ears, is there?” he asked. Her knees bumped his as she adjusted her position on the cold tile, and Hubert’s hands lowered to his lap. He looked to Meredith, who did her best to muster a comforting smile. “It could be worse,” she said. “—Ten?” she said looking down at herself. With a blush of modesty she then cupped hands over her chest, even though there was nothing to cover. Meredith reached out, pinching his right shoulder and smiling as he squirmed and waved her away. Then she unfolded a leg, lifting a foot to wiggle her toes in Hubert’s face. The naked children stood, helping one another to balance on the slick floor. Once standing, they paused looking each other up and down before jointly noticing Meredith was the slightly taller of the pair. “And… what then?” he asked. Hubert’s eyes became eased. Lifting Meredith’s hand, he kissed its back. “You’re a treasure,” he said. Her fair skin blushed as their fingers remained entwined. But with hands clasped, they both finally noticed a smell of decay over the odor of amniotic chemicals. Their faces became somber. Turning in the damp air, they saw two elderly corpses sitting lifeless and slack. One was a woman in a wheelchair, the other a man without an arm. Each bore a crown of silver wires connecting them to the chambers, and their clasped hands mirrored the children’s. First published December 11th, 2016. I love the end image. So, they get a second chance at happily ever after.